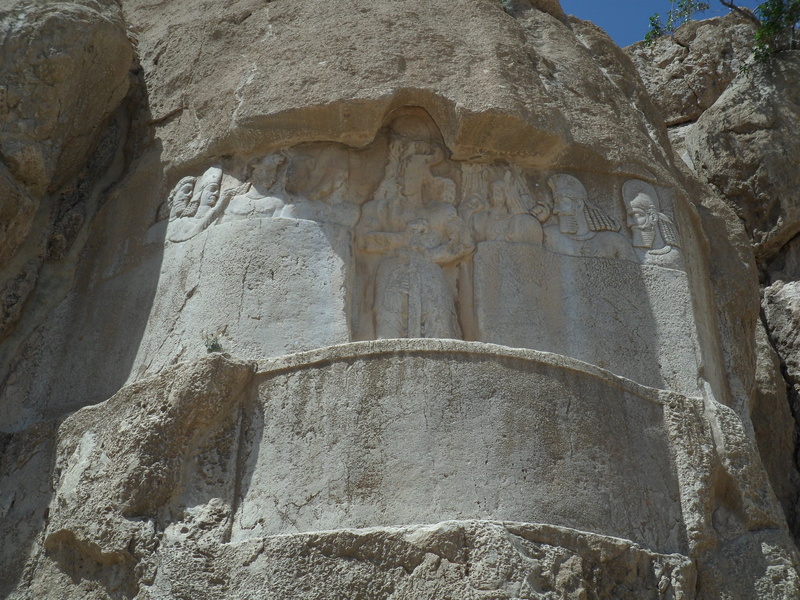 Naqš-e Rostam is famous because Darius and three of his successors were buried there in a new style of tomb cut deep into the rock, and for the mysterious stone cube (Kaˁba) which probably also dates to his reign. The reliefs by the Sasanid kings, and the long inscription of Shahpur boasting of his victories over the Romans, are also renowned. If you climb up from the parking lot past the souvenir shops and toilets through the remains of the Sasanid ring wall, and follow the cliffs beneath the tombs of the kings of old and past the Kaˁba, you will find something else. Four figures on the left, with bare chests or pleated tunics and long curly hair. Photo by Sean Manning, May 2016. 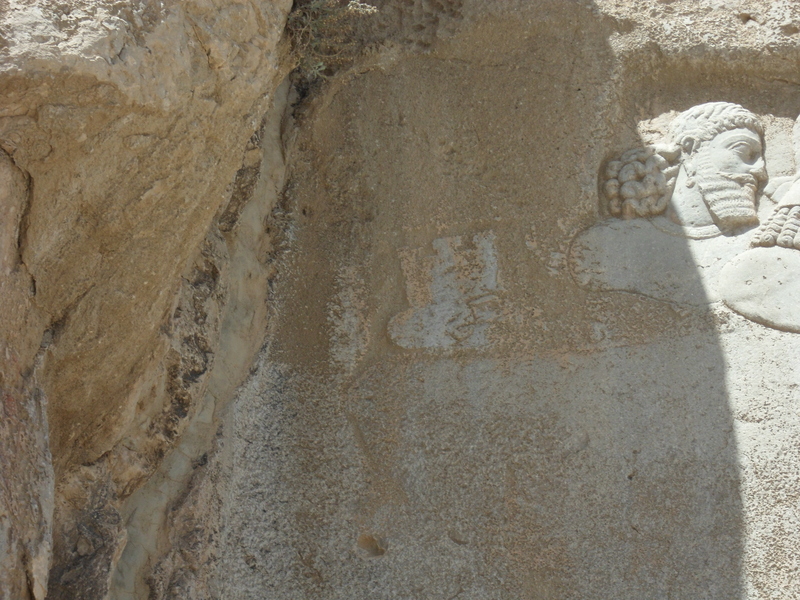 At the far left, a head wearing a corona muralis from the old relief is still visible. Photo by Sean Manning, May 2016. Three figures on the right. Under the rightmost figure traces of a coiled snake are visible. In Neo-Elamite art, kinds and gods often appear seated on a coiled snake. Photo by Sean Manning, May 2016. 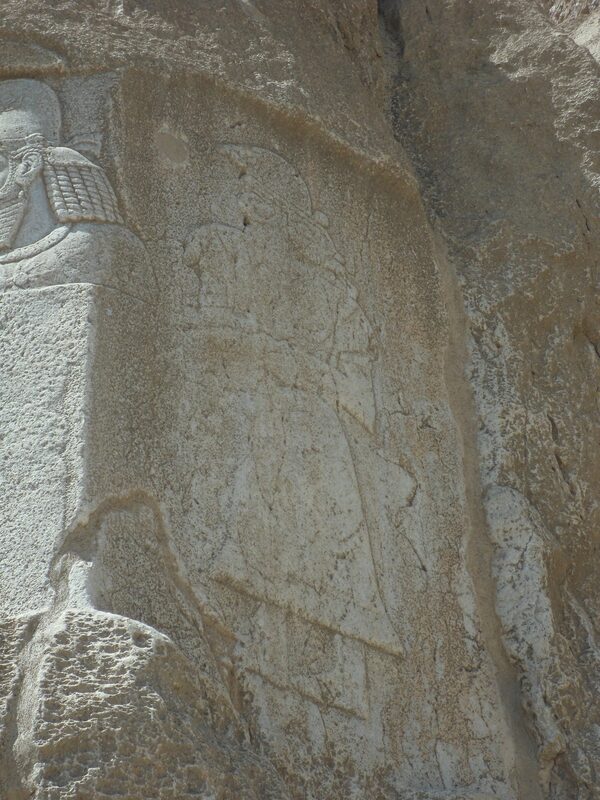 At the farthest right, a complete figure from the old relief has been preserved. Photo by Sean Manning, May 2016. And the figure at the furthest right is completely out of place. 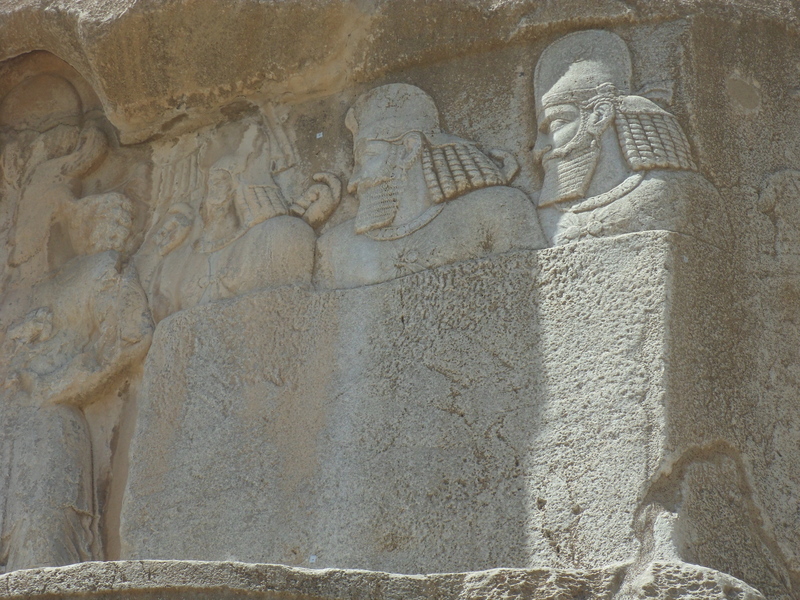 All of these things are typical of the Middle Elamite period around 2000 BCE, like the Lullubian reliefs at Sar-e Pol-e Zahab. 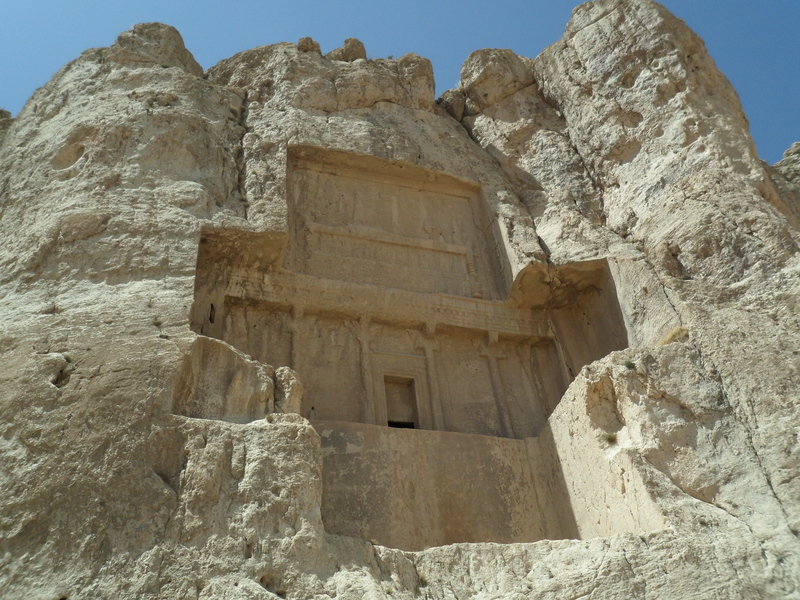 When Darius came and ordered his tomb to be built a few hundred meters down the cliff, the relief was already about 1500 years old. If he had asked learned Babylonians in his household, they would probably have given him a similar number, because some of Middle Elamite reliefs bore Akkadian inscriptions which mentioned kings from the King Lists, and because Babylonian scholars were interested in the styles of art and calligraphy used in particular historical periods. Darius ordered that his bigger, finer, deeper relief be placed within sight of the old one while leaving it untouched. 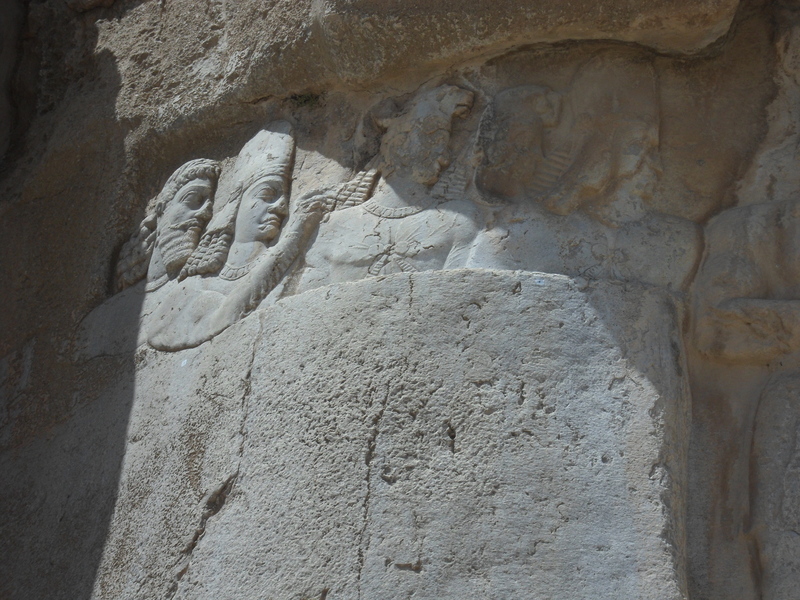 One of the Achaemenid royal tombs at Naqš-e Rostam. Photo by Sean Manning, May 2016. Eight hundred years later, another set of Persians did something very odd. They carefully erased the old relief, then carved their own relief around its margins to celebrate their king and his favourite god. But they left just enough that passers by could see there had been an earlier relief, and they did their best not to make their own relief impinge into the space which the earlier sculptures had occupied. This meant that most of the figures in the background of their scene are busts rather than full-height figures, and that most of the relief is now smooth and empty. When the first of their chisels touched the face of the cliff, the Elamite relief was about as far from them in time as they are now from us. Re-purposing and changing the public face of existing shrines is a common practice which includes the Hagia Sophia and the Pantheon. The Hagia Sophia was purged of visible portraits, but traces also remain. I wonder whether the remaining traces are a happenstance related to time and budget. Could leaving the traces visible have been an attempt to associate the political and religious rulers at the time as either heirs or conquerors compared to the originals?